Interested in financially supporting a specific event at The Watershed Center? We’re currently seeking sponsors for our Adopt-A-Stream Program and our Swim for Grand Traverse Bay events. 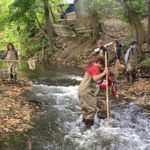 Interested in becoming an Adopt-A-Stream Sponsor? Find all the details here! 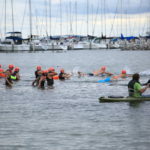 Swim for Grand Traverse Bay: Celebrate clean, healthy water in Grand Traverse Bay with one of the region’s only point-to-point open water swim events on Saturday, August 10, 2019, to benefit The Watershed Center Grand Traverse Bay, a non-profit that works to protect the bay and its 1,000-square-mile watershed. The second annual 2-mile bay swim begins at Greilickville Harbor Park in Elmwood Township and ends at Volleyball Beach, in beautiful downtown Traverse City. Interested in sponsoring the Swim for Grand Traverse Bay? Find all the details here! Kids Swim for Grand Traverse Bay: Our Kids Swim is a fun, untimed half-mile swim along the shore of west bay. It will take place on Friday, August 9 at 6pm at West End Beach and end at Volleyball Beach. Interested in sponsoring the Kids Swim? Find all the details here!